While it might not quite have the headline grabbing events of the past week, but there's still some interesting events for markets to be aware of next week. The flash September PMIs in Europe and the US highlight the economic data, while there's a number of potentially interesting meetings scheduled including a North and South Korea summit, an informal EU summit where Brexit will be a focus, US and Japan trade talks, and the UN General Assembly. There's also a BoJ meeting where the status quo is expected to continue. As DB's Craig Nicol writes, it's probably the various political events rather than the data or central bank meetings and speeches that markets will be most focused on. On Sunday Wall Street executives met with Chinese officials in Beijing in a meeting chaired by former PBoC Governor Zhou Xiaochuan to discuss trade tensions between the US and China, which however did not lead to any breakthroughs. On Tuesday we've then got the scheduled three-day summit between North and South Korea leaders Kim Jong Un and Moon Jae-in in Pyongyang. This will be the first trip by a South Korean leader to North Korea in eleven years. On the same day, the UN General Assembly opens although the general debate doesn't begin until September 25th. On Wednesday we've then got an informal two-day meeting of EU leaders in Salzburg with migration the key topic, but also expect Brexit to be discussed and therefore headlines off the back of it. Elsewhere, it's hard to ever rule out trade related headlines from having their say in markets. On Friday the second round of the US-Japan "free, fair and reciprocal" trade talks are scheduled to take place, although they may be canceled if Trump announces the $200BN in new Chinese import tariffs. Meanwhile it's a fairly quiet week for data next week but the highlight is the release of the flash September PMIs in Europe and the US on Friday. For the eurozone, the composite is expected to stay more or less stable at 54.4 with both the manufacturing and services components more or less unchanged also. In the US, the services print is expected to hold at 54.8 but the consensus for the manufacturing reading is a small jump to 55.0 from 54.7 last month. Away from that, the rest of the data in the US next week is largely second tier. On Monday we'll get the September empire manufacturing reading, Tuesday the NAHB housing market index, Wednesday housing starts, building permits and the Q2 current account balance, and Thursday initial jobless claims, Philly Fed PMI, leading index and existing home sales. In Europe, the final August CPI revisions for the euro area on Monday, August inflation in the UK on Wednesday and August retail sales data in the UK on Thursday are the highlights. There's nothing of note in China, while Japan's August CPI report on Friday is the highlight there. Speaking of Japan, the BoJ meeting on Wednesday is unlikely to be a particularly market moving event. Our economists and the market expect no change to the current policy stance following the tweaks made in July. However there should be some focus on Governor Kuroda's press conference and particularly any questions about widening the 10y JGB trading band - which we are yet to have seen any real evidence of. Another event to watch in Japan next week is the LDP leadership election on Thursday. The only candidates are Abe and former defense minister Ishiba. The expectation is that Abe will win re-election to a third term. Elsewhere, other things worth watching next week include EU Brexit Chief Negotiator Michel Barnier briefing EU Affairs Ministers in Brussels on Tuesday, Italy Finance Minister Tria also speaking at an event in Milan on Tuesday and Russian Finance Minister Siluanov meeting China's Vice Premier Han Zheng the same day, BoE Chief Economist Haldane speaking on Wednesday and ECB President Draghi delivering a lecture in Berlin the same day, and lastly euro area finance ministry officials discussing Greece, the EMU and budgets on Thursday. Finally, it's worth also noting that Friday is a quadruple witching day for US markets - something that only occurs four times a year on the third Friday in March, June, September and December - and which can trigger a decent uptick in volatility and volumes. For those rightly confused as to what this entails, a quadruple witching day is when the quarterly expiration of futures and options on indexes and stocks occurs on the same day. So something to be aware of even if a little left field. Monday: It's a fairly quiet start to the week on Monday with the highlight being the final August CPI revisions for the euro area. Away from that we'll get September house price data in the UK overnight, and the September empire manufacturing reading in the US. Tuesday: It's another quiet day for data on Tuesday with the September NAHB house market index reading in the US the only release of note. Away from that though, South Korea President Moon Jae-in meets for a three-day summit in North Korea with Kim Jong Un while the UN General Assembly opens (with the general debate beginning September 25th). EU Chief Brexit Negotiator Michel Barnier is also due to brief EU affairs ministers in Brussels while Italy's Finance Minister Tria is due to speak in Milan. Russia's Finance Minister Siluanov is also due to meet China Vice Premier Han Zheng. Wednesday: The likely main focus on Wednesday will be the BoJ rate meeting outcome. In addition to that, the two-day EU Summit in Salzburg will also be worth a watch. 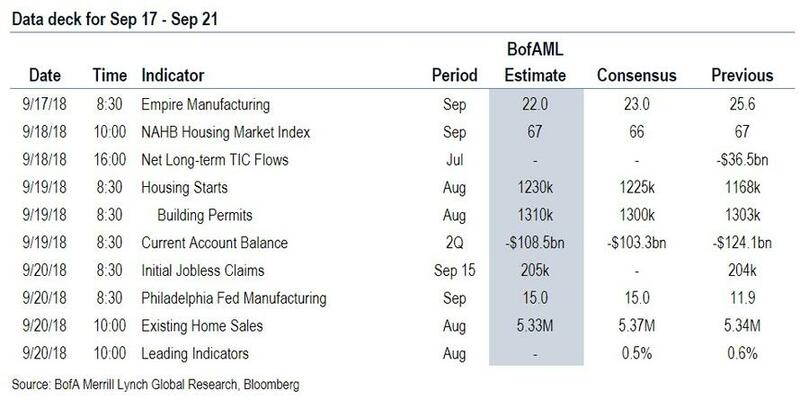 Data wise, August trade data in Japan, August inflation data in the UK, the Q2 current account balance in the US and housing starts and building permits also in the US will be released. Meanwhile ECB President Draghi is due to speak in Berlin while the BoE's Haldane speaks in Estonia. Thursday: It's another fairly quiet day for data on Thursday with August retail sales in the UK, September euro area consumer confidence, weekly jobless claims, August leading index and August existing home sales data all in the US due. Away from that Japan's Liberal Democratic Party Leadership contest outcome is due, while euro area finance ministry officials are due to meet to discuss Greece, the EMU and budgets. Friday: It's a reasonably busy end to the week on Friday for data. Overnight we'll get August CPI in Japan while the big focus in Europe and the US will be the flash September PMIs. The UK will also release August public finances data while France will confirm its final Q2 GDP revisions. Away from that, a second round of trade talks between Japan and the US is scheduled for the end of the week. Finally, here is a focus on key events in the the US from Goldman, which notes that the key economic releases this week are the housing starts on Wednesday and the Philadelphia Fed manufacturing index report on Thursday. 08:30 AM Housing starts, August (GS +6.4%, consensus +5.7%, last +0.9%); Building permits, August (consensus +0.5%, last +0.9%): We estimate housing starts grew 6.4% in August, a faster pace than in July (+0.9%). Building permits now look high relative to starts, especially in the volatile multifamily category. However, while housing starts still appear somewhat low relative to demographic trends, we expect higher interest rates and tax reform to weigh on homebuilding in the next few quarters. 08:30 AM Philadelphia Fed manufacturing index, September (GS +20.0, consensus +15.8, last +11.9); We estimate the Philadelphia Fed manufacturing index rebounded 8.1pt to +20.0 in September, recovering most of its 13.8pt decline in August. Other indicators of manufacturing activity such as the ISM have been fairly firm in recent weeks, and combined with encouraging industrial sales commentary, we expect a higher reading this month. 08:30 AM Initial jobless claims, week ended September 15 (GS 210k, consensus 210k, last 204k); Continuing jobless claims, week ended September 8 (consensus 1,705k, last 1,696k): We estimate initial jobless claims rose by 6k to 210k in the week ended September 15, following a 1k decline in the previous week, where the timing of the Labor Day holiday may have temporarily lowered claims. Initial jobless claims continue to decline steadily, and we believe there is scope for this trend to continue. 10:00 AM Existing home sales, August (GS +0.5%, consensus +0.8%, last -0.7%); We look for existing homes sales to increase by 0.5% in August based on regional housing data, following a 0.7% decline in July. Existing home sales are an input into the brokers' commissions component of residential investment in the GDP report.